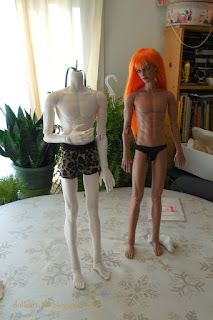 So here is a new, 2016 Soom Male Super Gem Body (formerly under a Brett, I think) along with Bird, a Soom Tremo, who has the 2012 body. The newer WS body is actually lighter in weight than the older one, and a lovely pinky-white shade, and a bit translucent--almost identical to my old IOS G in heft and color. The body, like Bird's body, does not really like to sit upright with the legs extended--just like every Soom I have owned, so I was OK with that. Same magnet hand system, same 2-part stringing with the legs on one circuit and the head on another, as shown by Bird in this post. Aside from being slightly taller and slimmer, the 2016 body has different elbows. The "peg" up inside the 2012 arm that annoyed and confused so many people is gone, with just this vestigial bump left to support the elbow in extended poses. Mostly it works quite well. If you are looking at a photo of a Super Gem and you can't tell which year it is, look at the inside of the elbows. The 2012 has a little ridge along the bottom edge, the 2016 does not. Here you can see that the 2016 has bigger hands as well. The 2016 has bigger feet, so you will need different shoes. The legacy shoes will not fit. The "Bear Claw" foot IS a 2016 foot, but it is the old size. I was not sure if it would even go on the new ankle ball, but it does; though the sculpt of the leg in back makes the smaller foot look odd. I just stuck a wire in there. You could also tighten up the strings (I prefer them loose) or try some hot glue sueding; I find the wire is the most reliable --I had to put galvanized wire in there (like coat hanger wire) because the holes drilled in the calves were too small to take my usual coated wire. Here the 2016 is wearing the even larger fantasy hands :D. You can see how his legs have more of a swooping curve than Bird's more upright legs. 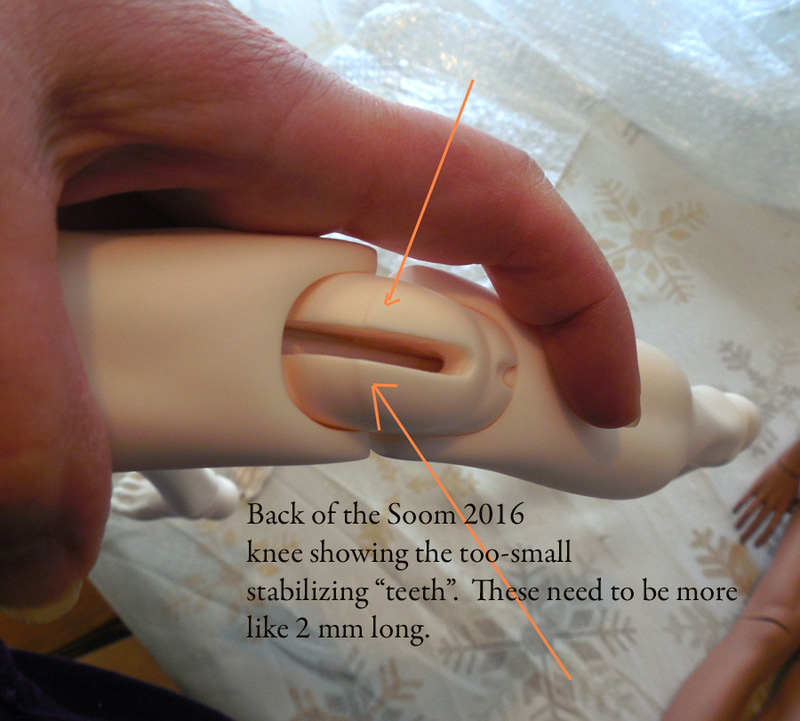 I almost forgot to mention that the knees on the new body don't have the "slipcover" that the 2012 does--that gave Soom problems in manufacturing, I think, because there were a couple batches where the covers were missing or if they were present, didn't fit well. They look nice-- but the fit has to be Iplehouse-exact, with perfect casting and sanding. I can see why they were left off the new body. Anyway, there it is. If you order one, buy some wire and enjoy him anyway--he's a pretty boy. Also, leave the feet alone. 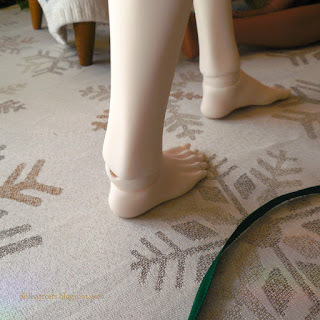 I had the worst time ever swapping the feet--I just hate resin hooks and these were especially balky to get the elastic over when the doll was strung. 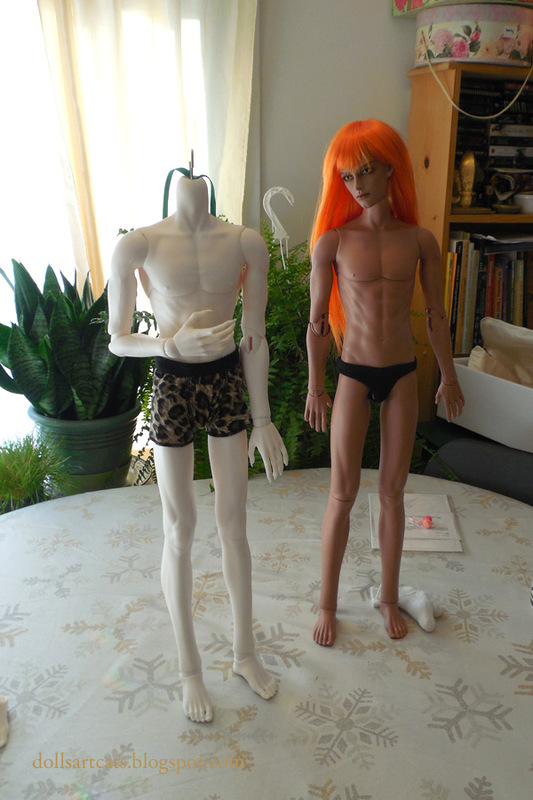 Soom Serin and Rico Mermaids again! The 2017 Photo Contest at Granado! No, I have Not Forgotten!